Maxi Mill® Sawing Systems utilize an overhead carriage that clamps logs on the ends. End dogging gives the overhead carriage the unique ability to clamp a log after it is fully scanned and optimally positioned for processing. Maxi Mill® carriages run on heavy duty precision machined vee and flat rails with hardened alloy steel wheels mounted utilizing Timken tapered roller bearings. Carriage movement is achieved by an electric regenerative DC carriage drive featuring all solid state controls. A special low inertia electric motor is paired with low inertia, high ratio, planetary reduction gears to provide precise carriage control, high performance, and reliability. Maxi Mill® offers systems with, or without, on-carriage 90 degree log rotation. Non-turning carriages are available for smaller logs that require higher processing rates of six to eight logs per minute. Non-turning systems feature pivoting end-dogs for quick reciprocation and positive log discharging. 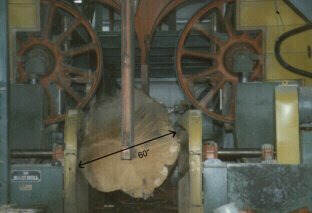 Maxi Mill® systems featuring on-carriage 90 degree log turning are available for processing larger logs at rates of four to six passes per minute. Turning Maxi Mill® systems utilize Temposonics® controlled hydraulic cylinders at both ends of the log to assure smooth, accurate, variable speed, log rotation across a large range of log sizes. Each turning dog is equipped with a tapered pin to assure a positive lock at precisely 0 and 90 degrees.